Soon this will be the only one up, fix your book marks! Our primary focus is Health and Temperament, We are not doing anything to better rats in general if we do not breed Sweet healthy rats. We breed mainly Hairless, Double Rex, Mink and its dilutes, Blue & Dumbo but we may at times have other available as well. I will slowly continue the triamese line that has become known here at CWR, however this will not be a main focus. Curly Whiskers Rattery was started May 2001. We are located in Boise, Idaho. 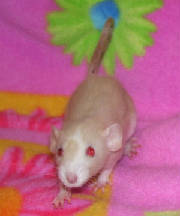 Our goal is to breed healthy and sweet baby rats (Show markings are just a plus). We do our best to be sure we breed only from the best lines available to us..We have traveled over 1000 miles to bring in some wonderful ratties to our rattery. Most rats that can be found here in Idaho are found in feeder bin's and although I have had some of the most wonderful "feeder" babys, not all are that way (The same can be said about breeder rats sometimes however). We provide an alternative to feeder bins. Usually a rat from a breeder is healthier and more "Tame". However again that all comes down to where the rat comes from. Our babies will be held from birth so they will be very loving babies!